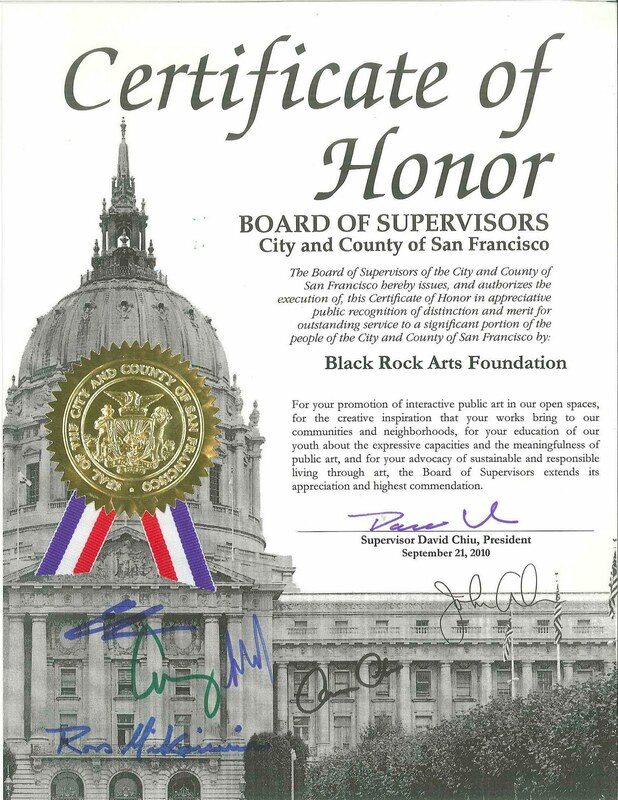 The Board of Supervisors of the City and County of San Francisco presented the Black Rock Arts Foundation with a Certificate of Honor in appreciation and public recognition of distinction and merit for outstanding service to a significant portion of the people of the city and county of San Francisco. The Black Rock Arts Foundation received this award for the promotion of interactive public art in open spaces, for the creative inspiration that our works bring in our communities and neighborhoods, and our education of young people of the expressive capacities and meaningfulness of public art, and our advocacy of sustainable and responsible living through art. This is what Commissioner Chiu had to say to the Black Rock Arts Foundation while presenting a Certificate of Honor to our Executive Director, Tomas McCabe; President of the Board, Freddy Hahne; Secretary of the Board, Alix Rosenthal; Vice President of the Board, Rae Richman; and one of the artists of the wonderful installation the Raygun Gothic Rocketship at Pier 14 on the Embarcadero. The Black Rock Arts Foundation was the organization behind bringing this great project to our spaces. They have been pioneering a very exciting new model for public art in which they partner with neighborhoods and communities and city governments to temporarily place city art projects. This has facilitated collaboration. Since the first installation that they assisted with several years ago, we have now had several major installations in various major public spaces throughout the city, which have been extremely well received from every neighborhood that they have been in. From my perspective and I think many of my colleagues share this perspective, we need to do everything we can to help our city really grow the artistic community and our city’s artistic economy. We need to promote best core values of activity, community, and activism. I want to thank those of you with the Foundation and the community for all you have been doing both for San Francisco, for the world and for our wonderful public spaces in our city. Thank you. Tomas McCabe, as the Executive Director for The Black Rock Arts Foundation then thanks the Board of Supervisors of the City and County of San Francisco for this Certificate of Honor. It is a real privilege to be able to serve the community with the Black Rock Arts Foundation’ s work. This is where our roots are, and this is where a lot of our activity happens. Although we are expanding worldwide, the Burning Man organization is world renowned, and a lot of people do not understand or realize that the Black Rock Arts Foundation supports artists all year round, and we have a big presence in San Francisco. Have you all see the rocket ship down at Pier 14? I highly recommend you go check it out. It is this beautiful retro futuristic looking rocket ship from the 1920′ s or 1930’s, and Flash Gordon comes to mind. When we were installing it, some elderly gentlemen wearing service caps, they were veterans of foreign wars, giggling like schoolchildren, were climbing up on to the concrete blocks trying to get photos of each other on the fence, so I offered to take some photos of them, and it was really touching. I was trying to make sure they got them all in there, and they said they did not care about them, but just get the rocket. The action was not behind a fence half an hour later and were still taking photographs and having a good time. That is the kind of work that the Black Rock Arts Foundation is able to bring to a civic setting. It is work that is cutting edge and fun and play ball, and it is not just a guy on a horse with a sword — fun and playful. I want to thank you for your support as well as the grants for the art — the department of art environment, who we have a program with. I would like to thank our board members who were introduced, and especially the artist, one of which is representative. If it were not for them, we would not be doing what we’ re doing. If you have a neighborhood with a park that could use some art, you have a community that wants some art, you know an artist that could use some funding, let us know, and we can help. Thank you.